Mason jar lid pies made with spiced peaches. Use just the top of a mason jar to make a mini tart pan. Such a cute mason jar dessert. Because I spent the first half of my pregnancy standing to the side in the mirror, pushing my belly out and exclaiming ‘I’m so big,’ while these days, I avoid mirrors and make my husband tell me at least 10 times a day that I’m not that big, I wanted to share a video I made, pre-baby. Well, technically the baby was in there, but I didn’t know it yet. TMI? Oh yes. More TMI in the form of this super long 10-minute video, BUT I cover exactly how I make my pie crust. The proper pie crust technique is just as important as the recipe, and I’m so excited to share it via video with you! These mason jar lid pies are one of my favorite desserts for two. They’re cute, perfectly portioned and customizable. I should warn you that baking in mason jar lids isn’t for everyone–they are not tempered for baking use, but for me, it’s a small risk I’m willing to take. I just flip the lid over so the rubber part is facing down. If you’re worried, try baking the filling in advance to speed up cooking time and reduce time in the oven. But if you’re still worried, make the little pies in oven-safe ramekins. Deal? Let’s eat pie together and smile lots, ok? These are the mason jar lids that I use. You need 2 wide-mouth mason jar lids, or 4 regular-sized mason jar lids. Take the wide-mouth mason jar lids and turn them so that the rubber ring is down. You want to cook the pies on the metal side. Next, make the crust: in a small bowl, stir together the flour and salt with a fork. Cube the butter into 12 chunks. Add half of the chunks of butter to the flour mixture and stir gently, and then add the remaining butter chunks. This is the most important step: use your finger tips to cream the butter into the flour. Pinch and smear the butter between your finger tips repeatedly, like you're snapping or making the 'pay up' sign in a gangster movie. Work the butter into the flour for quite a while, making sure it's evenly incorporated and the dough almost comes together in clumps when you squeeze it in your hands. The warmth of your hands is bringing the dough together, so if it's still flour-y, keep working it. Finally, add the vinegar and 2 tablespoons of the ice-cold water. Stir with a fork and the dough will easily come together into a mass. If you live in an arid climate, add the extra tablespoon of water. Scoop the dough out onto a piece of plastic wrap, shape it into a disk and store it wrapped in the fridge for 30 minutes. (If you store the dough longer than 30 minutes, let it warm up before rolling or it will be a cracked mess). Preheat the oven to 400 and line a small sheet pan with parchment. Place the mason jar lids with the rubber side down in the ring on the parchment paper. Thinly slice the peach and combine it with the ground ginger, cinnamon, lemon juice, flour and sugar in a small bowl. Stir very well. Set aside while you roll out the dough. Flour the counter and bring the dough out of the fridge. Place the dough in the center of your flour, and flour the top of the dough. Begin gently roll the dough out away from you, making a quarter-turn clockwise after every 2 rolls. This method keeps the dough from sticking to the counter and also creates a perfect circle. When you have a circle large enough for 4 mason jar lids, you're ready. Place 1 mason jar lid on the pastry and use a knife to cut 1/4" around the lid. Repeat one time. Use just the lid top (not the ring) to cut out 2 pie tops. You will have excess dough--you can make 3 pies, or make pie crust cookies in the oven while the pie bakes. Gently move the bottom pie crusts to the mason jar lids with rings and press it into place. Scoop half of the peach mixture onto each. Top the peach mixture with the pie tops. Brush beaten egg very generously on each mini pie. Sprinkle with sparking sugar, if desired. Bake for 35-37 minutes, or until the filling is bubbling and the crust is brown. Let cool 5 minutes. To serve, run a knife along the edge of the mason jar ring to release the pie. Everything in a mason jar just tastes better, in my opinion. These are adorable and I love seeing mini pies that just use the lids! Works perfectly as a mini springform pan! These are so fun! 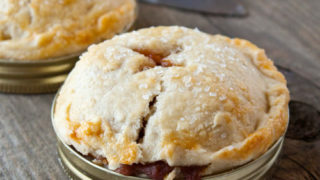 I would never have thought about baking little pies in mason jar lids. You are so incredibly creative! I adore single serving recipes and these pies are the cutest things ever! Ok first off… you are the cutest pregnant lady ever! I’m pretty sure that they maternity brands who have been contacting you to wear their clothes on your different shows… its because you are the cutest most adorable pregnant girl ever!!! No ounce of fat on you! But these mason jar lid pies… girl.. come to momma! These pies are adorable! I think most women stand in the mirror for the first few months after finding out they’re pregnant. You make the best videos Christina! Pregnant or not pregnant looking you are the cutest! Oh and now I want pie, Lord knows I have enough mason jar lids to make these. 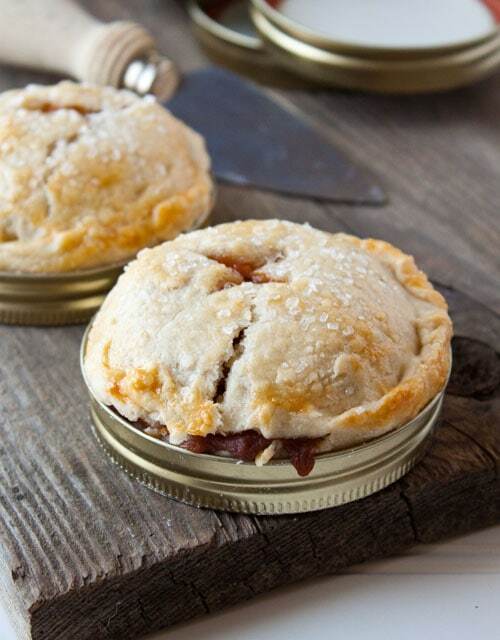 Mini pies…baked in Mason jar lids…it’s so southern I just can’t take it! Too cute! I just shared this with my facebook buddies and my mother. My mother would LOVE these! Great video, I can’t wait to put my gangster show me the money sign to good use! Mmm… Pie! Love this! The video is so helpful. I can’t wait to give it a try! Those are so cool!! loved the video! yummy! You are too cute! The video was great :) And those pies: words can’t describe how good they look! Your videos are always so great. I loved the explanation of incorporating the butter into the flour using the “pay up” sign haha. These are darn cute! Love the idea! This is SO adorable. I need you to come over and give me a tutorial on how you shoot this! Does your hubs help? You are a total natural on camera, the best! Love this and miss you, hope we can catch up soon. Love the growing bump pics on insta! Thanks! You make it look so easy… and delicious.! I’m a new fan! I’m so excited to see someone else make pie crust with their fingers! It’s how my mom taught me when I was a kid, and the one time I decided to try a pastry cutter I gave up after like 3 passes. :) I totally agree, fingers are the best tool. I’ve never tried adding vinegar, though, and will have to next time. Thanks for the tip! Awesome video! Making pie crust can be so tricky, but once you get a feel for it it’s so worth the learning curve. These little individual portions are totally cute! What is the risk when baking in a non-tempered container? You are NOT big—-and you are probably beautiful! These pies are beauties. In fact they are flat out cute! I don’t normally talk about ME, but please make note of the slight name change from Wild Goose Tea. New web design—whoopee and I am adding some new features along the way. Hi, I am just curious if these are freezable. I think you could freeze them before baking and add extra time for the baking (and do the egg wash just before baking). I wouldn’t freeze them after…the fruit would get soggy. How much total fruit do you need for the two mini’s? I would like to make blueberry pies. Thanks.